We’re the UK’s leading bowel cancer charity. We’re determined to save lives and improve the quality of life of everyone affected by bowel cancer. One of the ways we do this is by producing high quality bowel cancer information for the general public, including those at risk of developing bowel cancer, people who have been diagnosed and their friends and family. We make sure our information is accurate and up-to-date by using the latest evidence from research and clinical guidelines. However, our information does not replace the advice of your healthcare team. All of our health information is updated every two to three years. We try to make our information as clear as possible by writing in plain language and explaining medical words. We use health professional reviewers to check our information for medical accuracy. We also have a group of volunteers who have been affected by bowel cancer. They check that our information makes sense and answers all their questions. If you’d like to see a list of the references we’ve used to produce our information or would like to get involved, please email us. 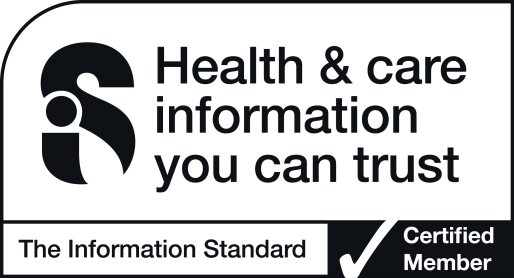 The Information Standard is a certification programme for organisations that produce evidence-based health and care information for the public. By achieving The Information Standard, we have shown that our health information is clear, accurate, balanced, evidence-based and up-to-date. Information Standard disclaimer: Bowel Cancer UK shall hold responsibility for the accuracy of the information they publish and neither the scheme operator nor the scheme owner shall have any responsibility whatsoever for costs losses or direct or indirect damages or costs arising from inaccuracy of information, or omissions in the information published on the website on behalf of Bowel Cancer UK. Our Younger people with bowel cancer: a guide for the under 50s. Our information pack, Your diet: Living with and Beyond Bowel Cancer, won the Self Care Resources Award. Our Bowel Health and Screening resource, which supports people with learning disabilities and their carers, won the Special Award for Learning Disabilities. We welcome your feedback on our information resources and whether you found them helpful. Email us with your comments.